Sun is an imperative source of energy; the energy of the sun has miraculous healing power. No wonder, the importance of the sun and the energy it provides to humankind and other living beings are admired in various traditions. “Surya Namaskar” or the “Sun Salutation” is an ancient yoga practice or method of expressing respect or showing gratitude to the sun, as it is the key source of energy. Sun Salutation incorporates a sequence of 12 gracefully linked asanas. It is believed that practicing the 12-posture of Surya Namaskar (Sun Salutation) daily can transform one’s life. According to the ancient yogi, these asanas have a phenomenal impact on the throat, chest, heart, stomach, intestine and legs. In simple words, Sun Salutation or Surya Namaskar is a form of full body workout. Each and every posture involved in Sun Salutations will control individual’s mind, body and spirit. Like any other asana, Surya Namaskar should be practiced on an empty stomach. And it is recommended to perform this asana only early morning and this should be performed facing the rising sun. Are you a morning person? If yes, then you will love it and if you aren’t, then we must say you should think about this yoga asana once because this set of 12 asanas does incredible things to your mind and body. It is the best way to relax and rejuvenate your body and it also helps you get through a stressful day with ease. That’s why yoga experts have called Surya Namaskar the base of power yoga. So, let’s dig into the topic and explore more about the 12 postures. “Surya Namaskar” is an amazing blend of 12 asanas and it is ideal to do these 12 postures to rejuvenate your body. The Pranamasana is the starting pose for Surya Namaskar in which you have to hold a prayer pose. The word ‘Pranam’ is a Sanskrit word and it means ‘to pay respect’ and asana means ‘pose’. In this pose, you have to stand at the edge of your mat, keep the body posture straight and feet together. Now breathe in and lift both your arms up and then exhale, join your palm together to form a prayer pose. Hold this posture for at least 30 seconds. Hasta Uttanasana is the second pose in Surya Namaskar and this is quite easy to do. It tones the organs and improve digestion. To perform this asana you have to lift your arms up and turn it in the upward direction. Fully stretch your arms and expand your chest and keep your feet together. Again hold this posture for at least 30 seconds. Pada Hastasana appears as the third pose and is also called as Uttanasana. This yoga pose is not considered as the best yoga pose for the novice as it requires a good amount of flexibility in the back, abdomen and legs. For practicing this pose, breathe out and bend forward from your waist. Just make sure that your spine is erect. Now inhale and bring your hands down on the floor and besides the feet. Ashwa Sanchalanasana appears as the fourth pose, now just after the Padahastasana, breath-in and move your left leg back as much as you can. Now, bow your right knee and place your arms just next to your feet and look straight. The Mountain Pose or Parvatasana is the fifth part of the Surya Namaskar series of asanas. While doing this asana, the body pose appears like a mountain from the sides and hence it is called Parvatasana. To do this pose, breathe out and gradually lift your hips and tailbone. Let you chest face downwards and try to form a reverse V. Again hold the pose for at least 30 seconds and then move to the next pose. Here comes the sixth pose – Ashtanga namaskara from the Sun Salutation series of asanas. This is the posture where majorly eight points of body contact with the floor: feet, knees, chest, chin and hands. To do this pose, gradually put your knees down to the floor and breathe out. Now take your hips back and glide forward; let your chin and chest rest on the floor. Slightly lift your buttocks and hold the pose for 30 seconds. Bhujangasana Or Cobra Pose appears as 7th pose in the series of Surya Namaskar asana. Bhujangasana is a Sanskrit word in which Bhujanga means snake. The pose imitates a snake lifting its head and that’s why it is known as Bhujangasana. To do this pose, you have to glide your body forward, raise your chest up little and bend your elbows. Make sure your shoulders placed away from the ears and look upwards. Now you have to perform the 5th variation of the series again. To do this pose, breath out and gradually raise your hips and tailbone and make sure your chest is facing downwards to form an opposite V.
Ashwa Sanchalanasana is the 4th pose of Surya Namaskar and it is also a 9th pose of the series. To perform this pose, breathe in and bring your right leg back as much as possible for you. Now bend your left knee and place your arms next to your feet and look straight. Pada Hastasana appears as both 3rd and 10th pose of Surya Namaskar asana series. To do this pose, exhale and bend ahead from the waist. While doing that, make sure your spine is erect. Now inhale and bring your hands down on the floor and besides the feet and breathe out. Now you have to again move to the 2nd variation of the Surya Namaskar asana series i.e. Hasta Uttanasana. For that, breathe in and lift your arms up and back and just make sure that your biceps are close to your ears. Now hold this posture for 30 seconds. So here the cycle will complete, as we reach to the last and the first pose again i.e. Pranamasana. This is a simple pose for which you have to keep your feet together. Let your shoulders rest and expand your chest. Breathe in and lift both your arms up. Now, exhale and keep palms together in front of your chest and hold this prayer position for 30 seconds. Who Should Not Practice Surya Namaskar? After the third month, pregnant women should avoid doing the Surya Namaskar. Individuals who are suffering from diseases like hernia and high blood pressure should also avoid practicing this asana. If you are suffering from a severe backache, then you should perform this asana under proper guidance. Women should not practice Sun Salutation during menstruation. Practicing this asana regularly will allow you to breathe in and out. The motion continuously which keeps your lungs under constant ventilation and ultimately it helps in improving the blood circulation and also removes the toxins from the body. The studies have shown that one minute of Sun Salutation helps you burn 3.79 calories. Regular practice of Sun Salutation will help you lose weight and also tone your abs and arms. It will also make your spine extremely flexible. These days, women are facing so much trouble in their menstrual cycle. With the help of Surya Namaskar, you can vanish the problem of irregular menstrual cycle and also ensures ease in childbirth. 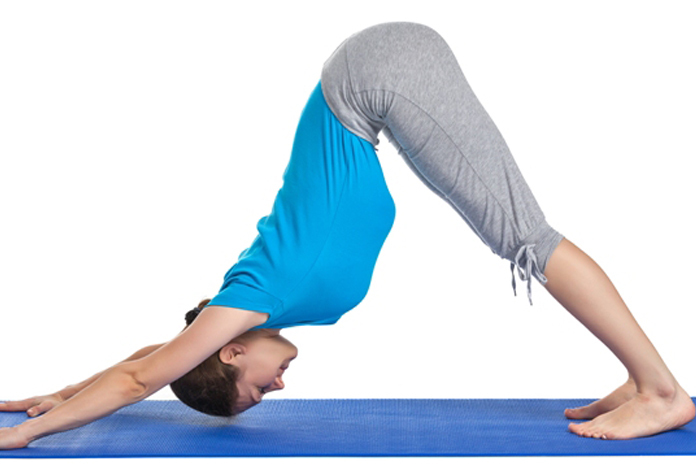 This sequence of 12 yoga asanas not only keeps you healthy but also helps you look youthful. This yoga asana improves blood circulation that ultimately enhances the glow of your face. Also, this is great for hair loss treatment as it prevents hair loss and graying of hair. The series of Surya Namaskar asana keeps you happy, calm and composed. And it will allow you to deal with stress and anxiety better. It improves memory and enhances the nervous system. It is no secret that Surya Namaskar comes with numerous health and lifestyle benefits. And practicing this yoga will impart you a magnificent life.